Inclusive Education, as defined and described by education experts, is a philosophy. It is not a program, nor does it happen in isolation. It can't happen in one classroom and not the other. The successful inclusion of special needs students requires the shared value system, resources and collaboration of the state/province, school district, home, school and classroom. Because the nature of inclusion requires so many components to it's implementation and success, it is often discussed by breaking it down into its topics and sub-topics. For example, we talk about co-teaching, differentiated learning, home-school communication, and IEPs. It is easy for people who are familiar with inclusion to know how all these pieces fit together to form an inclusive environment. However, for others, it still a mystery...a puzzle. How can a teacher with 30 students differentiate learning? Who is a co-teacher? Why does the entire school need to support inclusion? 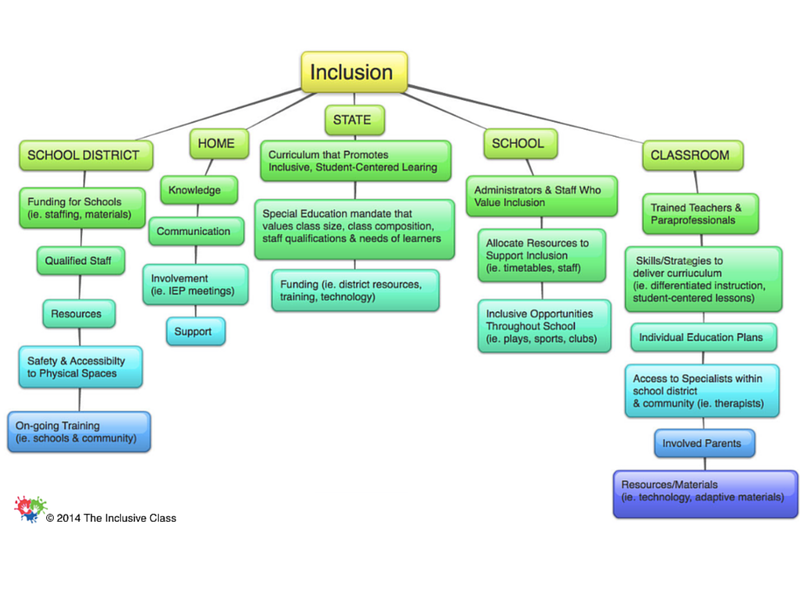 At the suggestion of my radio show co-host, Terri Mauro, a chart depicting the components of inclusive education might be quite helpful for many of our listeners (and readers of this blogpost) in putting the pieces of the "inclusive puzzle" together. It also helps meet the need of our visual leaners :) Please keep in mind that this chart is an overview, a work in progress and you will likely need to enlarge it for reading!